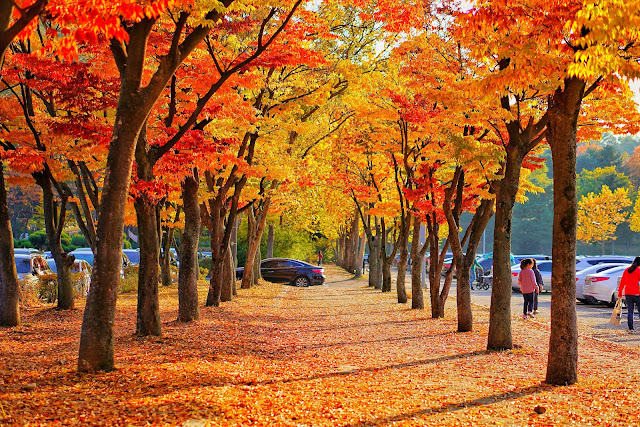 Autumn in South Korea is super gorgeous! After harsh summer with +/- 40 degrees Celsius and high humidity, autumn is like a short redemption before we start another winter. Autumn last during the short period : mid October until mid November. That time, the temperature get cooler around 8 degrees until 17 degrees and the most of all, trees are starting to change colors. Autumn start in northern part, Pyeongchang area-the same area that used for host of Olympic Winter Game and then goes down until Jeju Island. During this my favorite season, I carefully plan my autumn trip during weekend according to the peak season. Start with Seoraksan until Naejangsan National Park. But due to the unplanned trip to Jeju Island, my schedule got messed up and I missed Daedunsan and Gwangju Trip. But that's okay, I will visit them next year, If i am still here of course. Like I said, it started with Pyeongchang around mid October, but I skipped Pyeongchang because I visited pre-autumn season at Haneul Park or Nari Park. 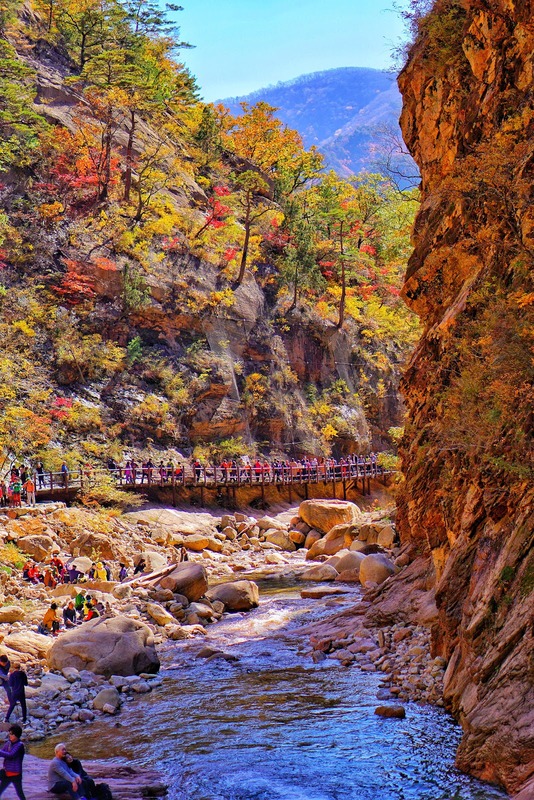 Seoraksan is most popular destination during Autumn season because it's close proximity from the capital, Seoul. That's why during the peak season, visitors should spare extra hours for traffic jam and walking time. My journey of autumn start here. We visited during peak time but many tress have shaded their leaves especially the one that has direct exposures to sun light. That's why we chose less popular tracks, Biryong Falls-that turns out as crowded as main trail. Track to Biryong Falls is 2.7 km long with medium skilled needed. There are steep pathway but not many. During the trail, you can enjoy the fresh colors of red and yellow tree and most of all the calming sound of the river. Biryong Falls itself is not too high and so-so. But the journey to reach there is very beautiful and refreshing. I rated the trip here 3.5 starred. Actually, this trip is unplanned because we are still tired from yesterday's tracking, we chose a place that not too far from Seoul. 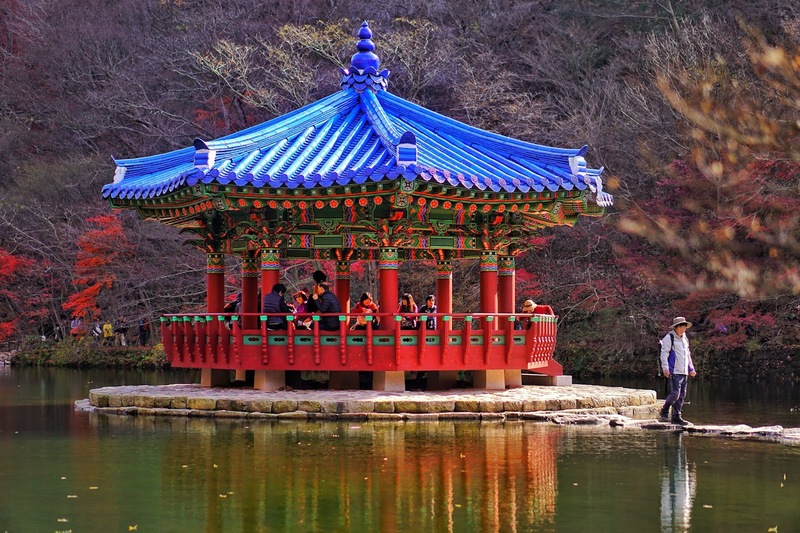 Seoul Grand Park is complex of zoo, park and amusement park. It is just located +/-15kilometes from the downtown. I knew the autumn wasn't coming yet to Seoul during that time, but I took a bet that at least we can see some parts of fall foliage. But I experienced better than I expected. Most of the hills were red and yellow, also the most interesting part, we can experienced almost all the area thru cable car. We purchase one way cable car which covered two different part of the park.We assumed, we can go back by walking after get off at the last stop while enjoying the zoo. And we are not wrong at all, the scenery were gorgeous, even could beat seoraksan. Because this spot is rarely recommended by anyone in the internet! 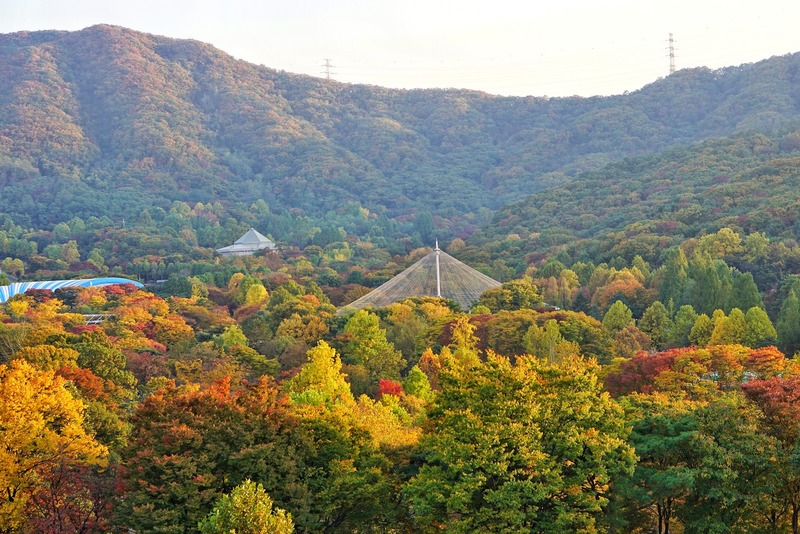 Nami Island is one of the most popular destinations to enjoy fall foliage especially among tourists. 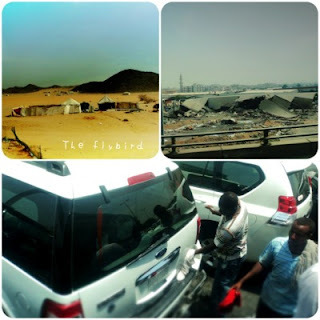 The popularity is massive that attracts million of visitors as well as traffic jam. I visited the island on late of October just according to the peak predictions, turned out rain has make the leaves fall earlier than expected. We arrived there with almost halves of trees already shedded. 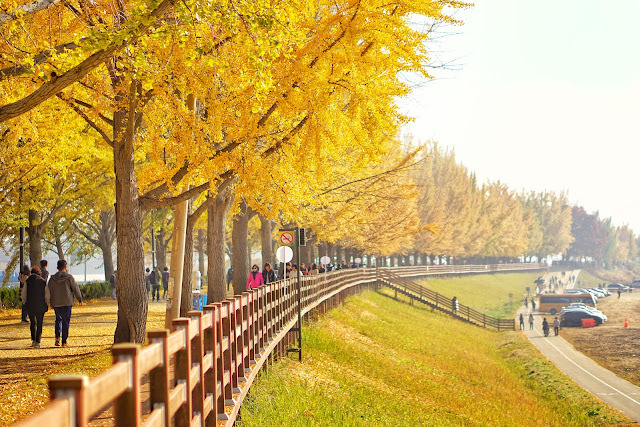 The most popular view is Ginkgo tress lane that yellowing both the sky and land. But be alerted, Ginkgo trees in here are female with special odor and sticky fruits. Farther than Nami Island, still in the same areas, there is popular spot for K-drama Shooting, Morning Garden Calm. This private garden is popular during spring and winter, but of course in autumn, this garden is still gorgeous! typical wooden fence that I love! Also, in here we can have bonuses to see lot of flowers included chrysanthemum in many varieties! 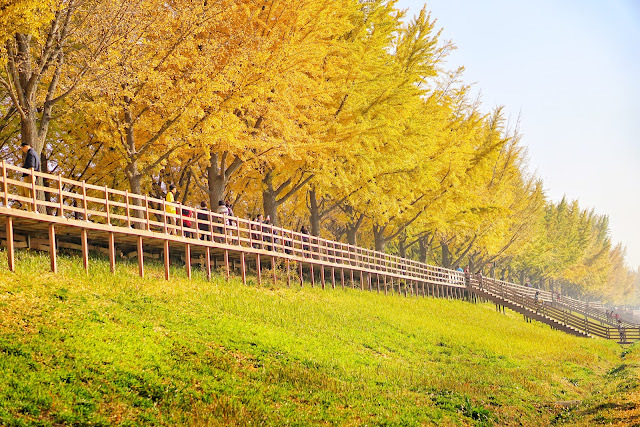 Here is the secret, Asan Eunhaeng Namu Gill atau Asan Ginkgo tree lane is underrated beautiful place that should be listed on your bucket list. 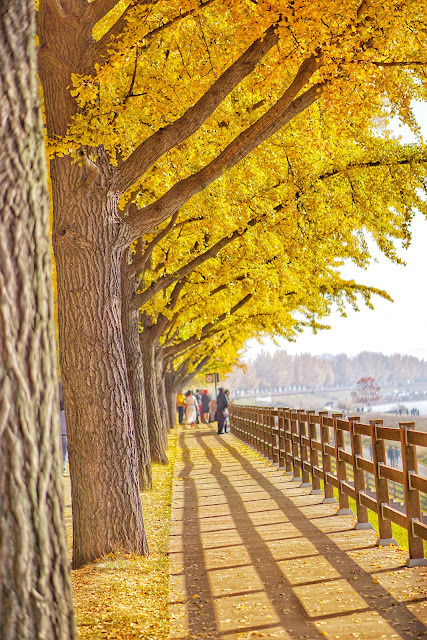 Asan is neighbor city of Seoul that famous because of Gingko trees. It is just 2.5 hours journey by metro or one hour 15 minutes by Nuriro Train. After the long journey at the early morning, everything was paid off. 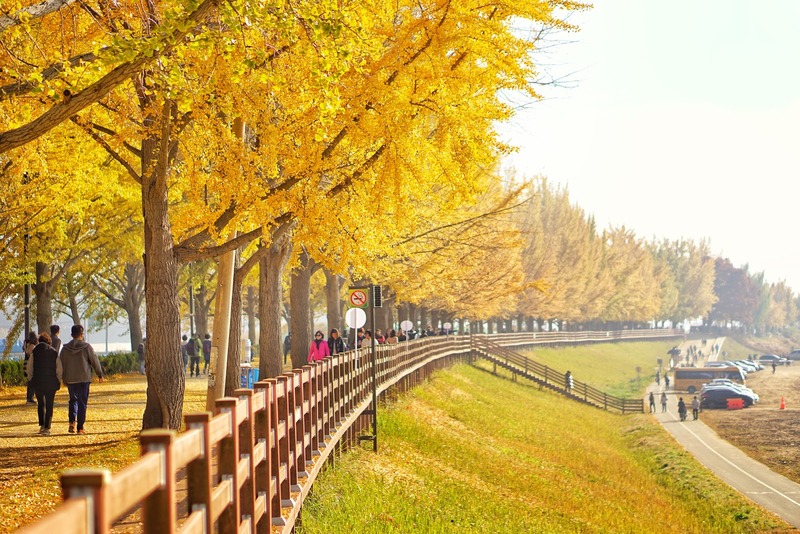 The lane is stretched 2 kilometers away along the riverbank, not included young ginkgo trees lane that yet developed canopy. Not many crowd in there, especially when you arrive early morning. The interesting part, ginkgo trees in here are male so no strange odor or sticky fruits in the street. Not far from the lane, there is a shrine, Hyeonchungsa Shrine that also a must visit place during the autumn. The star is the same, the Ginkgo trees but in this spacious shrine you can do little picnic in the park. Take KTX or Nuriro or Metro Line I. For KTX/Nuriro get off at Cheonan Asan Station transit to metro line 1, get pff at Onyang Oncheon Station and take bus 971, arrive at Chungnam Gyeongje Promotion Center. Well, if you'd prefer to stay at downtown Seoul, there are numerous places to enjoy autumn. On early November, the city's landscape starts become so colorful. 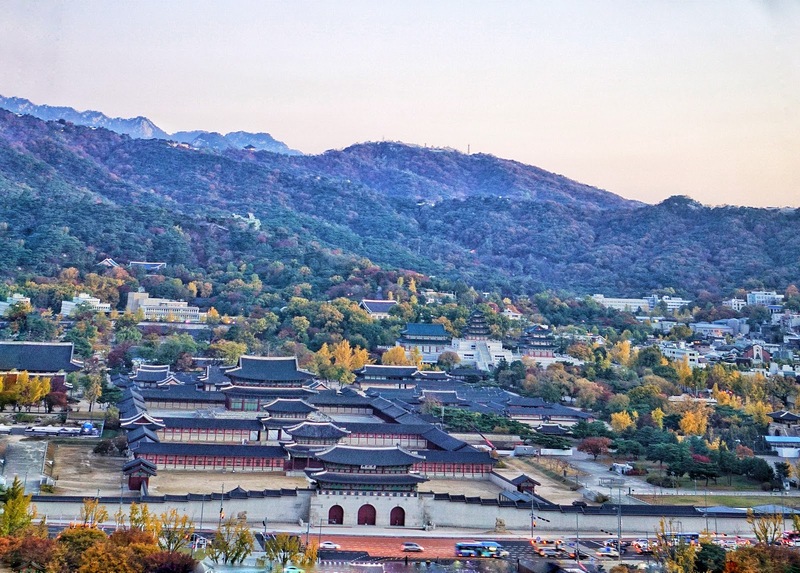 Since Seoul is surrounded by hills and mountain, you can see the hills covered by yellow, red and green color. Start from Namsan, Samnak and Bukhansan. 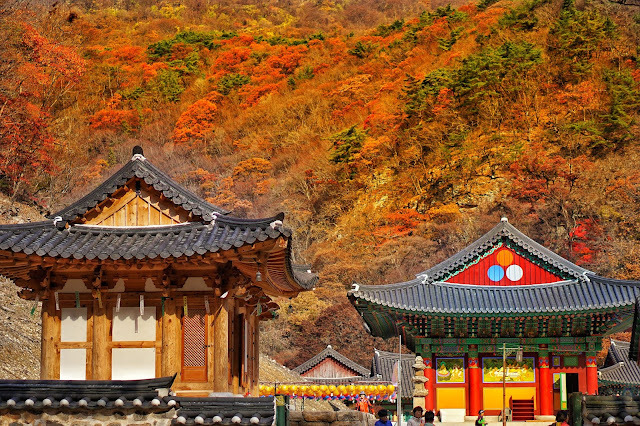 Naejangsan should be creme de la creme, the most beautiful place to see during autumn. But unfortunately, I visited two days after the peak and two days after heavy rain in Korea. 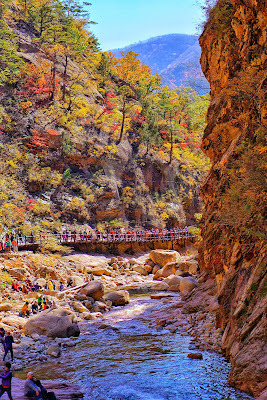 Almost all the leaves has been fallen, but even that, the Naejangsan National Park is still very gorgeous. 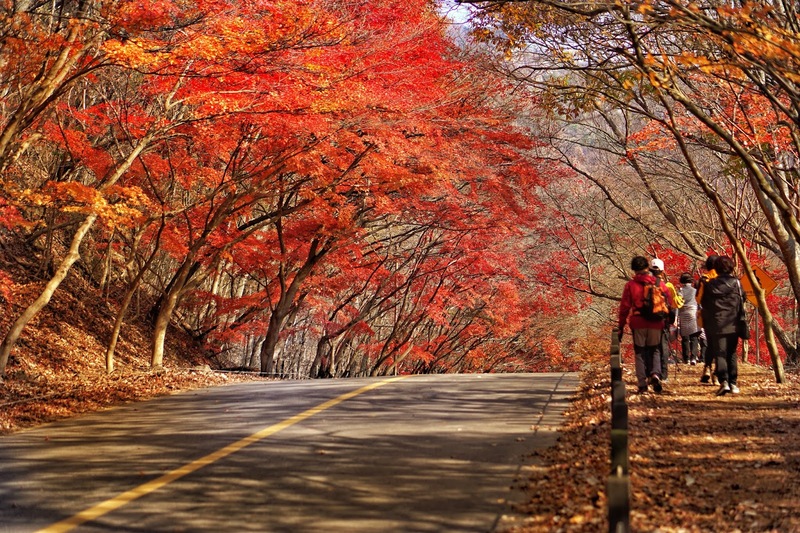 Naejangsan located 3 hours away from Seoul and home of Maple Trees. Every corner of the city of Jeongeoup (Naejangsan located in here), is covered by red colors of Maple trees. Since I love maple tree, of course next year i will visit Naejangsan again may be 2 days before peak-predictions. I even tried to hike to the observatory, but most of trees already shed also. So, depend on when you come to Korea or your love between Ginkgo and Maple, autumn in South Korea is the most beautiful time to visit this country.